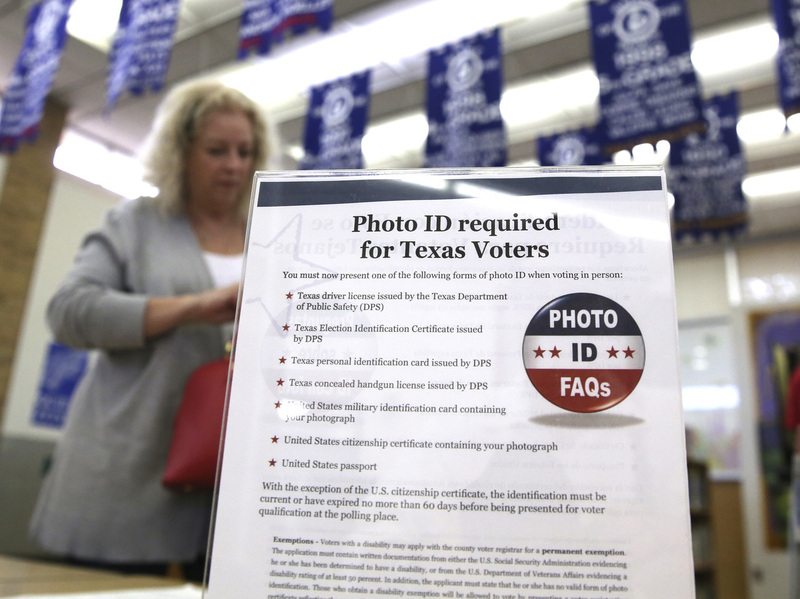 Federal Judge Tosses Out Texas Voter ID Law : The Two-Way U.S. District Judge Nelva Gonzales Ramos issued the injunction, writing that changes did not "fully ameliorate" the law's "discriminatory intent." She had struck down the original law in 2014. In her second ruling on the Texas Senate Bill, U.S. District Judge Nelva Gonzales Ramos said changes made to 2011 voter ID law did not "fully ameliorate" its "discriminatory intent." A federal judge in Texas has again thrown out the state's controversial voter ID law, which required voters to show one of several approved forms of photo ID to cast a ballot. U.S. District Judge Nelva Gonzales Ramos issued a permanent injunction against the law on Wednesday. In her ruling, the judge wrote that changes made to the law did not "fully ameliorate" practices she said were "enacted with discriminatory intent — knowingly placing additional burdens on a disproportionate number of hispanic and African-American voters." She also wrote that the injunction was the "only appropriate remedy." Gonzales Ramos had also thrown out the law, then known as Texas Senate Bill 14, in 2014. The state appealed that ruling to the Fifth Circuit Court of Appeals, which largely upheld Gonzales Ramos' opinion, and ordered a temporary fix for the voters in the 2016 election. The Texas Legislature made changes to the law during its session earlier this year, allowing voters without ID to sign a document stating they could not reasonably obtain one before they voted. This revised law was SB 5. Texas Attorney General Ken Paxton has promised to appeal today's ruling, calling it "outrageous." "Senate Bill 5 was passed by the people's representatives and includes all the changes to the Texas voter ID law requested by the 5th Circuit," said Paxton said in a statement. In the same statement, Paxton also pointed out that the U.S. Justice Department had argued on behalf of the new changes. The support by the DOJ of the Texas voter ID law is a reversal from the Obama administration, which joined Democrats and minority rights groups in challenging the 2011 law.